During our Ypres Battlefield tours, Chapters from the Western Front, Ypres Remembered and Ypres One Hundred Years On (our special tour for 2014), we stay in beautiful Ypres. The once prosperous medieval Flemish cloth town was all but destroyed during the First World War and steadily rebuilt in the decades following the conflict. 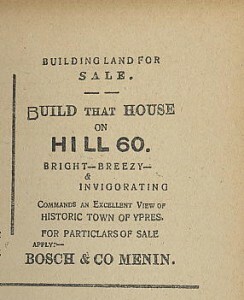 Several of the original casements or chambers still survive in the town ramparts and one was home for a while to The Wipers Times, the British literary antidote to the devastation of the Great War. The British have always been known for their sense of humour in times of trouble, and there is no finer example of wry irony, wit, pathos and eternal hope. The newspaper was often produced in hazardous conditions, at one point only a few hundred yards from the front line and it quickly became the voice of the average British Tommy, relaying his experiences, grief and anger during the entire conflict. Irreverent and very funny, its humour and satire provide a lasting insight into life in the trenches in the First World War, featuring were killed by a U-Boot while in the trenches), letters to the editor complaining hilarious adverts for homes to be built on notorious battle sites, adverts for dugout spring cleaning companies, insurance policies for troops (only valid if you about the dreadful state of the roads in Ypres and concerns that far too many soldiers were playing at being poets. 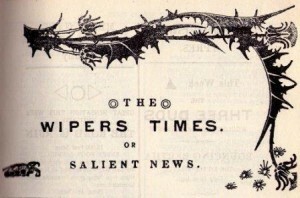 The paper ran until December 1918, adopting such titles as The New Church Times, The Somme Times, The BEF Times, and finally Better Times, produced when the war had ended. You can still buy the complete series if you look hard – it is well worth a look!